Work on the first of Atlantic Crossing’s two blocks is underway, with activity staged to minimize inconvenience for neighbors and visitors. The site has been prepared, with excavation for the first underground garage underway. 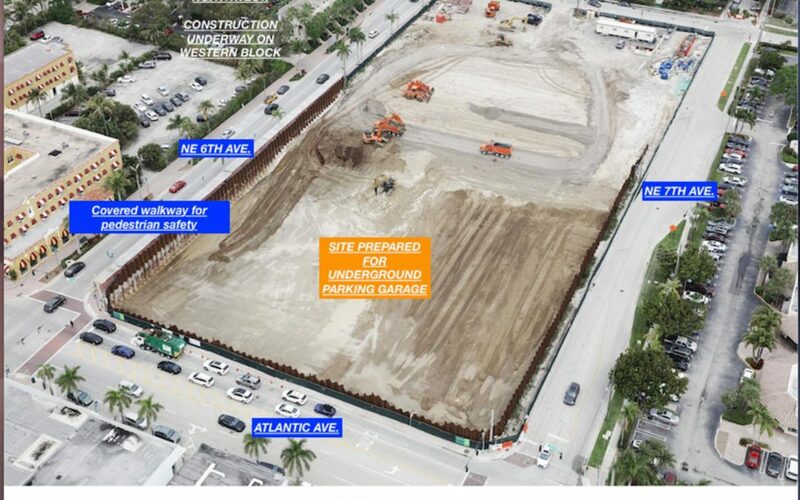 For pedestrian safety, covered walkways are in place along NE 6th Ave. and will continue along Atlantic Ave. between NE 6th and 7th Aves. The only street closure is NE 7th Ave. north of NE 1st St., implemented at Palm Trail neighbors’ request, with bike and pedestrian access remaining open.